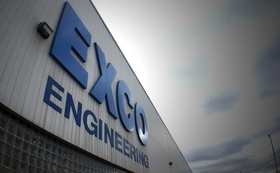 DETROIT -- New technologies that made vehicles smarter, more flexible and easier to build earned 13 suppliers, including Exco Engineering of Newmarket, Ont., a 2019 Automotive News PACE Award Monday night. One supplier, Tenneco Powertrain, formerly operating as Federal-Mogul, received two awards -- one for an aluminum alloy used in manufacturing diesel pistons and the other for a software tool that predicts powertrain behavior in the development of piston rings. The PACE Awards program, celebrating its 25th anniversary, recognizes suppliers for making a product or process innovation and delivering it to the market. Winners were announced at a black-tie ceremony at the Max M. and Marjorie S. Fisher Music Center. The 2019 awards brought attention to a spectrum of technology advances, including Lear Corp.’s flexible seat architecture for next-generation vehicles; an innovation in 3D printed dies from Exco Engineering; an advancement in lidar technology by the Silicon Valley company Velodyne; and an improvement in electric-vehicle battery thermal management from Gentherm Inc. The annual innovation awards are judged by an independent panel of industry experts who review new auto industry technologies from around the world. But creating a new technology or product improvement in a laboratory is only the first test in qualifying for a PACE Award, said J Ferron, PACE director of judging. The supplier also must bring the innovation to market. The 2019 awards also spotlighted three automakers for projects in which they worked closely with a supplier to bring about a desired innovation. Audi was awarded for its development of an automated driving satellite compute platform with Aptiv. General Motors won an award for working with Tula Technology Inc. on its Dynamic Skip Fire technology. GM won a second partnership award for its work with Ushr on a high-definition advanced driver’s map. The startup automaker Nio won a partnership award for working with Flex to develop a multicomponent interior environment. Here is the list of 2019 Automotive News PACE Award winners. GM, for its partnership on the Dynamic Skip Fire technology with Tula Technology Inc.